Chutney is a must be it with dosa or idli or any snack. Here is a variety of coconut chutney that we konkanis prepare to go with dosas and idlis. A very tasty dosa prepared with Mangalore cucumber makes a very yummy breakfast. This dosa is eaten with lots of butter on top with coconut, asafoetida chutney. Surnali is a sweet dosa, eaten with loads of ghee and sugar on top. 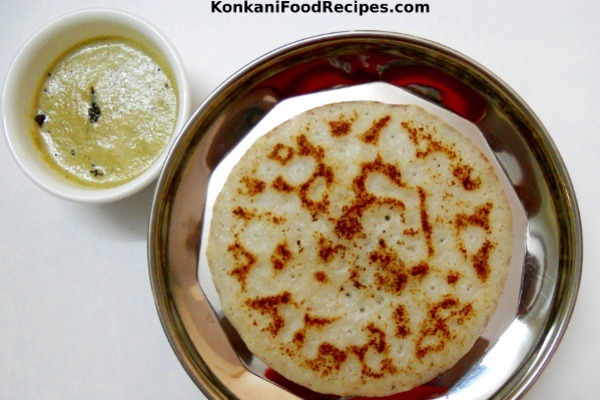 Rice, fenugreek sweet pancakes are called as surnali/godu polo in Konkani. Charbure upakari or mundakki upkari is a very much loved street food of Udupi, Mangalore region. It is sold at small stalls by the road side vendors.